All good things seem to come to an end, and sadly the festival season is finishing in the next few days…the fiery finale in the form of the Fireworks Concert brings the Edinburgh International Festival and Edinburgh’s summer festival season to a resplendent conclusion. Set against the iconic backdrop of Edinburgh’s historic Castle, this event brings together stirring orchestral music from the Scottish Chamber Orchestra and magnificent pyrotechnics, specially choreographed by international fireworks artists, Pyrovision. Over 400,000 fireworks launched from Edinburgh’s imposing Castle make this one of the biggest fireworks concerts in the world. Around a quarter of a million people gather across the city and beyond to share in this annual grand International Festival finale. Children are welcome in the gardens. Children under 5 are free but ticketed. Standard price tickets are available for children over that age. You can enjoy the fireworks from other vantage points around the city though, including the links, Meadows and the various hills around Edinburgh too !!! The fiery finale to the Edinburgh International Festival will be held on Monday 31st August at 9.30pm in Princes Street Gardens. Set against the magnificent backdrop of Edinburgh’s iconic Castle, the evening brings together the stirring playing of the Scottish Chamber Orchestra with an incredible concert-long fireworks display, specially choreographed to the music. 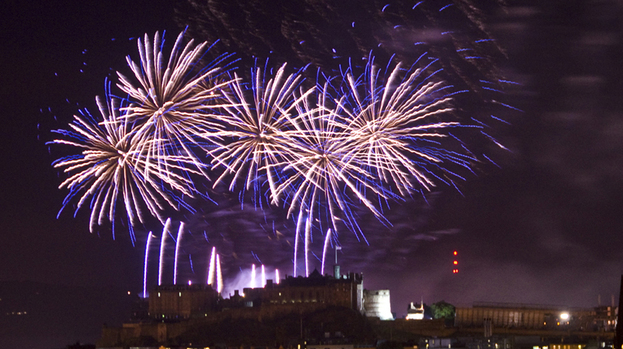 You can see the Virgin Money Fireworks Concert from Inverleith Park where they have a free family viewing area, a mile to the north of the City Centre. This area is ideal for family’s with young children as it is less busy. It has good views of the castle and a live video link and sound system to capture the Concert in the Gardens that accompanies the fireworks display. It’s not as exciting as being up close, under the castle, but you can avoid the uptown crush of Princes Street. Get there earlyish – proceedings start at 7pm . Wherever you are in Edinburgh, join in and hear the music live by tuning into Forth 1 97.3 from 9.00pm. With the summer festival season drawing to a close, the dramatic and spectacular closing fireworks concert is a lovely event to catch. It will be on Sunday 31st August, with the fireworks concert starting at 9pm. This year there will be a family viewing area in Inverleith Park -family entertainment is being provided and there’s even a big screen so you can watch all the action from the Ross Theatre. The park opens at 7.00pm and entry is completely free.